As winter comes to an end, so too, is the United Kingdom’s lingering vegetable crisis. Vegetable stock from numerous European countries is predicted to make a full recovery by April, following wintertime shortages as a result of bad weather. The shortages, which hit lettuce, spinach, courgette and broccoli the hardest, have dramatically affected the U.K.’s major grocery retailers including Tesco, Morrison’s, The Co-Operative and Ocado… (read more at AccuWeather). Just a trial run for now. No full out famine yet, just a little deprivation, to test the waters. How does the European dilemma fit with Weather as a Force Multiplier:Owning the Weather in 2025 as well as weather as a profit center and means of controlling populations? Another article on the subject of weather control and profit of futures markets: Are the Rothschild Elite Banking on the Weather? When the fruit trees are in bloom, tiny plants are peeking out of the soil – and a big hail storm or hard freeze occurs, you may consider the angle of the futures market and the ownership of weather. It’s important to be clear that the word “incurable” in modern medical parlance means only that doctors do not yet know what to do for a particular disease or condition. An example of a condition that is supposedly irreversible, incurable and not preventable is Alzheimer’s disease. The news from researchers and people who have been courageously dabbling with a radical non-pharmaceutical “treatment” (coconut oil – see link to preliminary research below) indicates that Alzheimer’s is neither irreversible nor incurable, and that means that it also is preventable. Many “new cures” confirm the wisdom of Hippocrates’ dictum, “Let food be your medicine”. Indeed, pure foods are safer and much less expensive than drugs. Relatively few of us suffer directly from Alzheimer’s, but many of us suffer from losing our family members to Alzheimer’s. And yet one needn’t wait for Alzheimer’s to strike. Fact is, we all may benefit from the addition of coconut oil to our daily routines. When the man in this video – Steve Trueblue – joined his 85-year-old father in the daily coconut experiment, he reported that his own physical strength and recovery curve improved significantly. At the same time, both he and his mother achieved deeper relaxation and better sleep. Steve credits coconut oil for his greater stamina and mental clarity plus an increased ability to focus on what he is engaged in doing. It also helped him from being sidetracked into eating and drinking unnecessarily. An added benefit is that it appears to help some people lose weight because it ends overeating. Athletes have known about the benefits of coconut oil for a very long time, but the Alzheimer’s issue only came to the public’s attention when Dr Mary Newport tried feeding her stricken husband coconut oil – and his mental faculties returned. She has since written a book and has been given a grant to study the subject. It sounds as if the grant requires her to frame the “cure” in terms more mysterious than “coconut oil”. The KISS (Keep It Simple Stupid) principle means don’t get more complicated than is absolutely necessary. I had a personal friend whose father’s dementia problems were reversed when his wife fed him coconut oil daily, years before Mary Newport released her findings. Dr.Mary has been given a grant to study the use of coconut oil and its effects. Preliminary studies were independently performed in Spain and the [happy] results were released in December of 2015 by The National Institutes of Health. The Spanish study found that taking 3 tablespoons of extra virgin coconut oil each day resulted in “improvement in cognitive status, improving especially women’s, those without diabetes mellitus type II, and severe patients.” I’ll be interested to read the followup study. Once upon a time it was illegal for farmers to not grow hemp. Then came corporations that felt hemp threatened their profits. 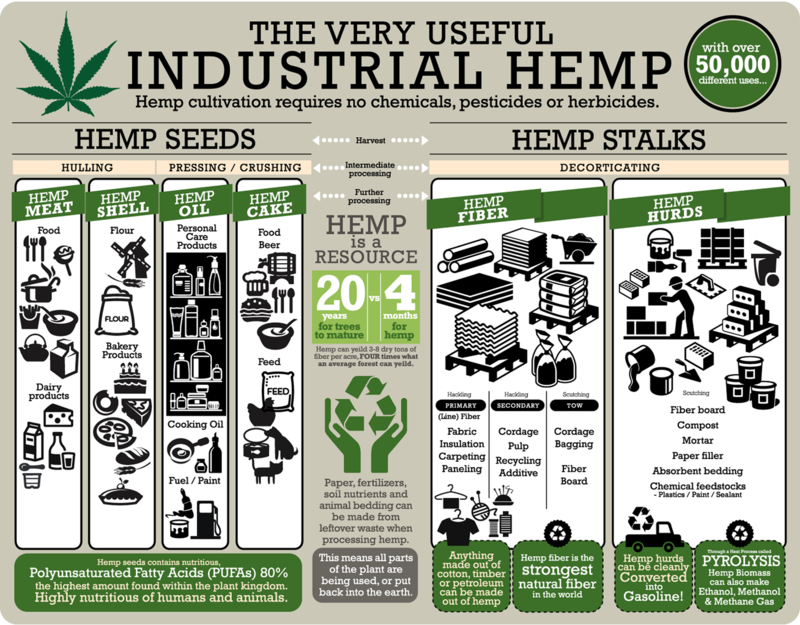 The oil industry, pharmaceutical companies, plastics manufacturers, the food industry, lumber companies, paper producers, fabric manufacturers – and many more – felt that hemp was unfair competition, as it was an easy-to-grow, all-in-one plant with many gifts for humanity. Hence, the demonization of hemp in the newspapers that were owned by fearful corporations. But the public is finding the evidence is in – what serves corporations does not always swerve life or well-being. Therefore, it’s just about time we “Just say no” to naughty corporate corruption and reintroduce this life-saving plant back into our country – and the world. The U.S. government holds the patent on cannabis as a cure for cancer. What’s with that?!?!? While our loved ones have died of cancer (and its modern medical treatments: chemo, radiation and surgery) and have left us in morbid debt to the medical industry, they could have avoided all that pain and sorrow if they had been allowed to ingest hemp oil instead? Although the negative stigma associated with cannabis has lessened in recent years – especially since THC- and CBD-rich oils were found to be a powerful aid in fighting cancer – it still hasn’t garnered full support from the public. If the balance of scientific evidence favors plant-based eating, why isn’t the medical profession at the forefront of encouraging people to eat healthier? That’s the question this video tries to answer. Looking back to smoking in the 1950s, you can see how all of society, the government, and the medical profession itself could be in favor of habits that decades of science had already overwhelmingly condemned as harmful.